Most people don’t like ice. It’s uncomfortable. It’s cold. It’s wet. After a while, it makes you ache. We try and protect ourselves from ice and cold as much as we can. So why, oh why, would you let your Massage Therapist put ice on you for part of your massage!?!? 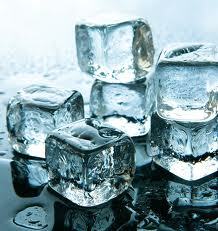 Especially with chronic issues, cryotherapy (Ice massage) can be better for you than heat. Heat will increase inflammation, if any is present, which would exacerbate the pain-causing issue. The way it works: your therapist takes some ice and rubs it on the area he/she wishes to massage. There are stages of ice that you have to bear through in order to get the most benefits from it: cold, burn, ache, hurt, and then finally to the numb stage! Getting your body to this point is where you will have the most beneficial factors for cryotherapy. It usually takes around 7 minutes with the ice cube (usually 20 if you are icing yourself with an ice pack or a bag of peas) for the area to get numb. Then the fun begins! The therapist can then dig in on the area and break up scar tissue, tight fascia, or knots that won’t go away, while you are getting the benefit of icing the area, which calms everything down and allows the body to really take a look to see what’s going on with your shoulder, or your lower back, or whatever your issue is. Ice is not fun to get, but I promise you that it will help you get greater relief from certain aches, pains, and limited range of motion.